The long-term trend for Commodities, Gold, Silver, Copper & Miners remains down at this time. Could the long-term bear trends be coming to an end? Possible! This chart looks at the Australian Dollar where it highlights that the AU$ has spent the majority of the past 30-years inside of the blue shaded rising channel. 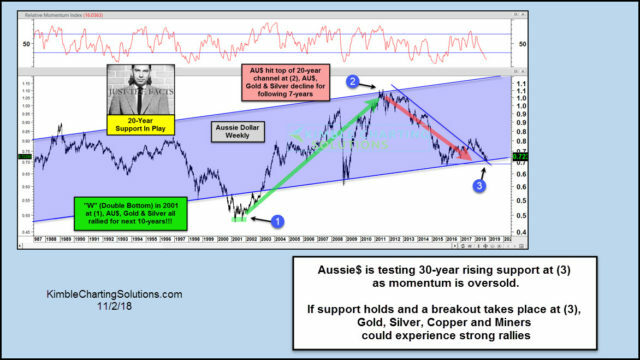 The correlation between the AU$ and commodities has remained high over the past 30-years. The AU$ created a "W" (Double Bottom) back in 2001 as a 13-year bear market was coming to an end as a new 10-year bull market was getting started. As the AU$ was moving moving much higher from 2001 to 2011, Gold, Silver, and Commodities went along for the ride. The AU$ peaked in 2011 as it was hitting the top of this 30-year channel, where a major trend reversal took place. As the AU$ was peaking in 2011, Gold, Silver, miners, and Commodities did the same! The 7-year bear market in the AU$ has it now testing 30-year rising support at (3). Joe Friday Just The Facts Ma'am- The AU$ is testing 30-year support at (3), with momentum oversold. If 30-year support holds and it breaks above falling resistance, it would send a bullish message to Gold, Silver, and Commodities not see in years! If taking advantage of opportunities in Gold, Silver, Miners, and Commodities is of interest to you, check out our Metals and Commodities weekly reports!